The Chinese yuan weakened on Monday afternoon after its midpoint was set at its lowest level in half a year. China’s authorities sets the mark 0.87% or 594 points lower than last Friday, the biggest daily decline since late June in 2016. Traders are allowed to trade up to 2% either side of the reference point for the day. The Hong Kong Interbank Offered Rate for offshore yuan, known as the CNH Hibor, plummeted to 14.05% from last Friday’s 61.33%, down 4,728 points. The People’s Bank of China set the yuan midpoint at 6.9262, a sharp drop for the renminbi compared with Friday’s fixing at 6.8668. China’s central bank does not allow the currency to move more than 2% from its daily fixing in onshore trade. While policymakers cannot closely control offshore trade of the currency, it usually remains relatively close to its onshore counterpart. 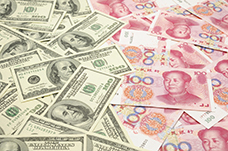 Onshore, the dollar was fetching as little as 6.8679 yuan last week, compared with 6.9318 yuan at 9:54 a.m. today.